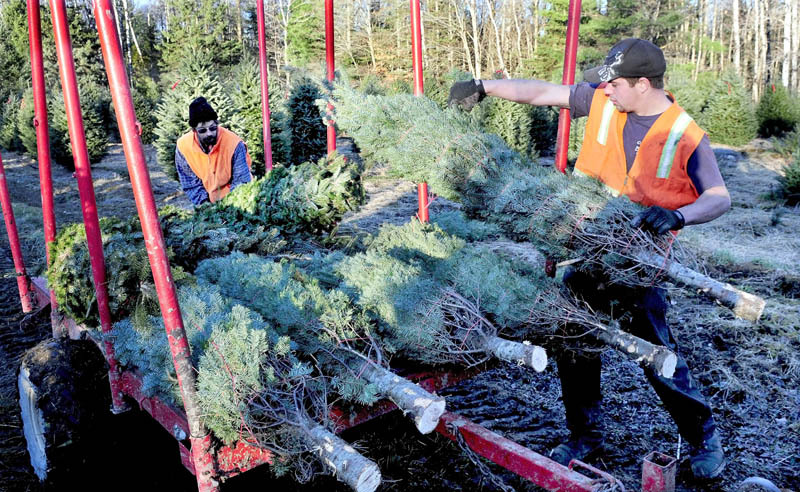 Shane James, left, and Cody Wolf load bundled Christmas trees at The Forest tree farm on West Ridge Road in Cornville on Monday. Owner Bryant LePlante said he will be open through the holidays starting this Saturday. "This has been a great year weatherwise for growing trees," LePlante said. Shane James, left, and Cody Wolf load bundled Christmas trees at The Forest tree farm on West Ridge Road in Cornville on Monday. Owner Bryant LePlante said he will be open through the holidays starting this Saturday. “This has been a great year weatherwise for growing trees,” LePlante said.